Situated on the central coast of Vietnam, Qui Nhon fills the much needed beach niche between Hoi An and Nha Trang—it lies almost equidistant between the two tourist hotspots. Easily reached by plane, bus and train, it’s surprising that more people don’t choose to spend more than the absolute minimum in Qui Nhon and the province of Binh Dinh. It has a noteworthy beach in its own right, without any of the hustle or crowds. The government is revamping the city as part of a big push for tourism and interesting changes are underway. When it comes to the beachfront, the metamorphosis looks promising. The public beach is immaculate and so far, development directly on the beach has been limited to only a few hotels and resorts on the south end of the strip. A wide promenade and long, leafy boulevard hugs the coast. There’s no tacky restaurants or tourist gimmicks, only a waterfront abundant with green space, parks, gardens and rubbish bins. Even the US Army tank which was half buried in the beach for decades (and made for a great photo op) had recently been removed. It’s all neurotically tended to and cleaned up by crews throughout the day. We’ve never seen anything like it in Vietnam. Virtually empty in the day time, the beach and boulevard gently stir with activity at sunrise and sunset when locals come out for some exercise, football, a cooling dip or a lazy cycle. One of our favourite moments was seeing an elderly couple motorbiking up and down the waterfront clearly just out for a sunset joy ride. As you can probably surmise, Qui Nhon is about low-key local experiences—no novelty mud baths or Russian menus here. It’s really fantastic cheap Vietnamese food—we’d hang out in this city just to graze. Fill the time in between feedings with some Cham towers, beach hopping and crossing the second longest overseas bridge of the country. When you’ve had your fill, Qui Nhon is an ideal place to jump off west into the Central Highlands including Pleiku, Ayunpa and Kon Tum. We find Qui Nhon charming and worth spending at least a day in, but we concede that many travellers go to Qui Nhon not for the city itself but to get to Bai Xep (pronounced bai sep), a beach 10 kilometres south. Once an isolated bit of coast occupied by a fishing village and a boutique luxury resort, Bai Xep is now home to two ultra laid-back backpacker hostels and a mid-range guesthouse. You can’t find beachfront accommodation for this price in Nha Trang, Hoi An, Mui Ne, Phu Quoc or Con Dao. Budget travellers allot a few nights here and end up staying weeks. Bai Xep retains some of its local feel, with fishing boats and the village. A small isle in front creates a natural barrier and swimming is possible even during the rainy, windy months. The hostels are good about helping travellers have fun and explore—hiking to a waterfall (rainy season only), fishing trips, bonfires and movie nights. Highly recommended is a boat trip to explore the tiny islands and beaches to the south or to the north, near the Phoung Mai Peninsula, culminating with a delicious seafood meal at a local restaurant. 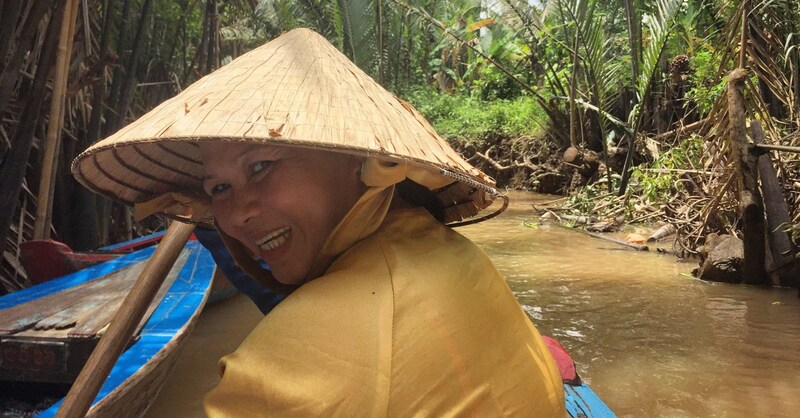 This type of experience is a must for travellers in Vietnam. But the future is not all sunshine and roses for Qui Nhon. Additional hotels are underway on Bai Xep and just one more could tip the scales from “charming” to “avoid”. Part of the big campaign to attract visitors, Phoung Mai Peninsula is being developed for tourism a la Viet. Quy Nhon Beach and Golf Resort, an obscene 1,500-room megaresort was underway across 1300-hectares. Parts of the hotel have already opened in 2017. In the end it will supposedly boast “seven-star” villas, a golf course, convention centre and an entertainment complex (we spied a Safari Park under construction). For all its progressive attitudes with its waterfront, its vision includes harmful, gaudy development. Orientation Binh Dinh province lies south of Quang Ngai province, north of Phu Yen province and to the east of Gia Lai of the Central Highlands. Heading south from Qui Nhon, QL1D runs along the coast connecting to beaches like Bai Xep. QL1A remains inland, rising steeply over a mountain pass before veering back to the coast and merging with QL1D. Both are scenic. Qui Nhon is located on a peninsula. A four-kilometre long beach curves up to a tip which is given over to a series of important ports that service the province, as well as the Central Highlands and parts of Laos and Cambodia. In the middle of the length of beach, a wide boulevard Nguyen Tat Thanh runs perpendicular from the sea north to Ly Thuon Kiet St. This is what the locals consider the city centre. Parts of it are flanked by green space, a promenade with benches, local pubs, karaoke, electronics shops and a shopping centre with cinema and Coopmart grocery store. Head here to shop for supplies, or to Big C shopping centre beside the bus station.  Please sign up as a Travelfish member to download the Qui Nhon guide PDF (7.7 MB, 39 pages). Membership costs just A$35 per year (less than A$1 per week) and gives you access to over 250 PDF guides. Last updated on 28th February, 2017. Browse our independent reviews of places to stay in and around Qui Nhon. Read up on where to eat on Qui Nhon. Check out our listings of things to do in and around Qui Nhon. Read up on how to get to Qui Nhon, or book your transport online with Baolau. Planning on riding a scooter in Qui Nhon? Please read this. 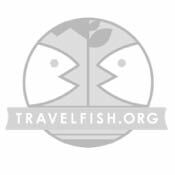 Use the above map to find specific destinations in and around Qui Nhon which are listed on Travelfish. Bed icons indicate a guesthouse, hostel or hotel, the knife and fork is an eatery or bar and the four-way circular thingy marks sights, attractions and other points of interest. Click on any icon for a short pop-up and a direct link to the page for that spot. If you are in the area, use the teardrop icon near the top left to show your position on the map (you'll need to allow position sharing for this last feature to work).